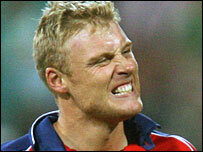 Andrew Flintoff is unlikely to play for England until summer 2008 after having a fourth operation on the left ankle which has caused him so many problems. The all-rounder has been ruled out of the Test series in Sri Lanka in December and will almost certainly miss the tour of New Zealand in early 2008. Captain Michael Vaughan said: "He will be sick to death at missing more games. "I just hope he can come back because he's great to play with. This might be the mental freshener he needs." The new operation comes just four months after the previous surgery, which has failed to produce the required results. Flintoff travelled to the Netherlands for Friday's operation, where he went under the knife of Professor Niek van Dijk, one of the world's leading authorities on arthroscopic ankle surgery. Since having his first operation in early 2005, he has struggled for an injury-free run in either the Test or one-day side and has missed 11 out of the last 16 Tests. On Tuesday, Sir Ian Botham told BBC Sport it was high time the 29-year-old changed his bowling action to limit future ankle problems - but the player himself has been reluctant to do so. Vaughan, speaking to BBC Sport, added: "It's a big blow for him to miss out but the most important thing is that he comes back fit and is a lot stronger when he does return. "He will be greatly missed in Sri Lanka, but we will have to get on without him. He's got to make the most of these next few months to get his ankle as good as he can." In a statement, the England and Wales Cricket Board said: "It is considered unlikely that Andrew will participate in the tour of New Zealand. "The priority will be for him to regain full fitness ahead of England's domestic international programme in 2008." He is expected to resume full training in early January. The ECB went to extremes to get the right advice to deal with Flintoff, who missed the whole of summer 2007 barring the end-of-season one-day series against India. Even then, he had to bowl in considerable pain and was rested for three of the seven matches. He also grimaced with discomfort throughout the ICC World Twenty20 in South Africa, despite only having to send down four overs in each match. But after consulting "leading international specialists" in the UK, Australia and the United States, the ECB has opted for yet another operation to attempt to alleviate the problem. During it, fragments of bone pressing on a tendon were removed from both the front and back of the ankle. The ECB claimed the surgery was performed successfully, adding: "At this stage, the surgeon is optimistic that he has addressed the underlying root of the problem."